A summary of recent industry developments and the need for a systemic change in fire regulations. Former HSE Chair Dame Judith Hackitt has called for a new regulatory framework for building regulation that is as clear and effective as the Construction (Design and Management) Regulations (CDM). 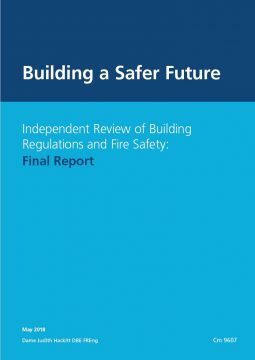 The Independent Review of Building Regulations and Fire Safety was commissioned by the government after the Grenfell Tower fire in June 2017. Hackitt, who chaired the review, has stated that there are “deep flaws in the current system” and that the recommendations in her report will lead to “a clearer, simpler but more robust approach to the building and ongoing management of high-rise residential buildings”. Ignorance – regulations and guidance are not always read by those who need to, and such guidance is often misunderstood and misinterpreted. Indifference – the primary motivation is to do things as quickly and cheaply as possible rather than to deliver quality, safe homes. Concerns are often ignored and some of those undertaking building work fail to prioritise safety. Lack of clarity on roles and responsibilities – there is ambiguity over where responsibility lies, made worse by ‘fragmentation’ in the industry, and precluding robust ownership and accountability. Inadequate regulatory oversight and enforcement tools – the size or complexity of a project does not seem to inform the way in which it is overseen by the regulator. Where enforcement is necessary, it is not often pursued. Where it is pursued, the penalties are insufficient to be a deterrent. The report identifies several other flaws in the system, including poor levels of competence and a failure to listen to residents when safety issues are identified. Hackitt calls for the development and implementation of a regulatory framework which strengthens regulatory oversight, effectively deters non-compliance levels, sets clear roles and responsibilities, and raises competence levels. The initial focus of fire regulations will be on multi-occupancy higher risk residential buildings (HRRBs) that are 10 storeys or more in height. The report identifies several recommendations that are needed to implement this new framework, but also warns that it will take time to fully implement the required systemic change. 5 key recommendations for improving fire safety in HRRBs. The introduction of a new Joint Competent Authority (JCA) comprising Local Authority Building Standards, fire and rescue authorities and the Health and Safety Executive to oversee better management of safety risks in HRRBs across their entire life cycle. The development of rigorous and demanding dutyholder roles and responsibilities to ensure a stronger focus on building safety. It is proposed that these roles and responsibilities will broadly align with those set out in the CDM regulations. More rigorous enforcement powers. The report recommends a wider and more flexible range of powers to focus incentives on the creation of reliably safe buildings from the outset, and more serious penalties for those who choose to “game the system” and place residents at risk. Giving residents a “voice in the system”, including providing greater transparency of information on building safety, better involvement in decision-making through the support of residents associations and tenant panels, and a “no-risk” route for residents to escalate concerns on fire safety where necessary, through an independent statutory body. A clear and identifiable dutyholder with responsibility for building safety of the whole building. It is proposed that the dutyholder during occupation and maintenance should maintain the fire and structural safety of the whole building, and identify and make improvements where reasonable and practicable. 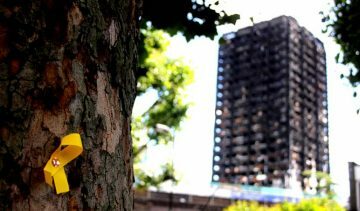 Whilst Hackitt’s report looks to address the systemic failures of fire safety in HRRBs as a whole, she stops short of recommending an outright ban on combustible cladding and insulation similar to that which appeared to spread fire on Grenfell Tower. This omission has been met with widespread criticism from campaign groups and MP’s who believe such materials should be banned. The Prime Minister however has said that the government is willing to ban flammable cladding, and has recently agreed to spend around £400m to remove and replace unsafe cladding from council and housing association tower blocks. Whilst the police investigations and public inquiry into the Grenfell Tower fire are likely to continue for some time, the government should act fast to implement the findings of the Hackitt review and overhaul fire regulations covering high-rise and complex buildings. Fire safety needs to be included throughout the lifecycle of a building, and clear roles and responsibilities must be embedded in the procurement, design, construction and occupation phases. Only a systemic change in fire regulations, culture and behaviour will ensure that people living in high rise buildings are safe – and feel safe – in their homes.